Matt and I were stressing about how to get ourselves plus Teddy and Isaac to the L.A. women’s march in downtown Los Angeles. Should we risk the metro crowds and potential wait times with two small children and all of their gear? What about the bus? In the end, we decided to drive. (#LosAngeles) Our hope was to park somewhere nearby and then to walk the rest of the way. The closer we got to downtown, the more energy we felt. People in small groups with signs were walking on the sidewalks. The cars next to us weren’t manned by a single driver but filled to capacity with people. As it happened, we lucked out and found a $9 parking spot at the music center. 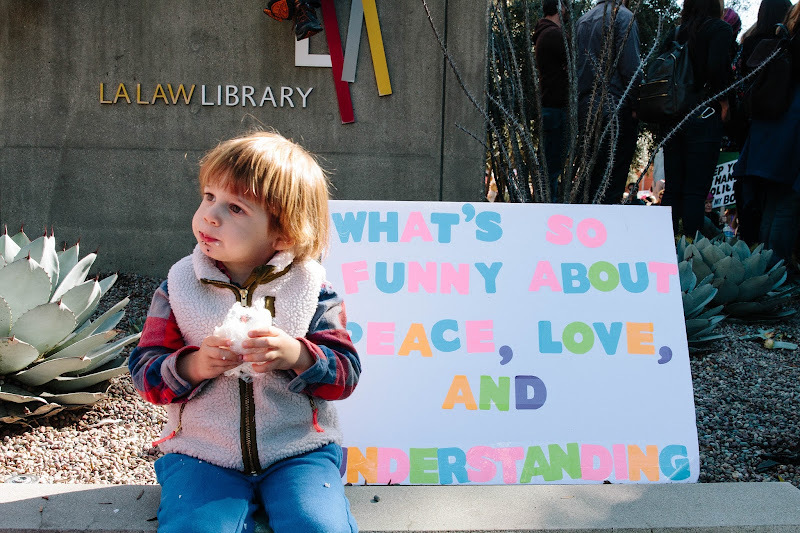 We got the kids, the stroller, all their accouterments, and our signs and made our way to the street. We saw more people, more signs. The energy grew. We headed toward City Hall. We walked one block east and then, just as we reached the corner, down First Street, we saw a mass of people. I can safely say that I’ve never seen anything like it. My eyes filled with tears. It was ten in the morning and all these people were already there. It was such an amazing, uplifting afternoon. None of us are alone in this fight! And I’m so glad that mom.me allowed us to include the short bit of footage that I think captures some of the emotion. One of the saddest things and the thing that’s possibly the hardest for me to deal with in this Trumpian era is the way facts have been so thoroughly and effortlessly dismissed and disregarded. Oftentimes these “facts” that are being casually brushed aside are people’s realities, people’s history. That Saturday afternoon, I felt heard and understood—maybe not by many of the politicians who are in office right now, but by my fellow Angelenos. It was so beautiful. These past three months, I’ve been driving around with my Hillary bumper sticker still on. I’d considered making a few more stickers to add to it. Something like, “I’m still with her!” followed by another one: “And her: [image of planet earth].” But the other day, I had a moment of clarity, coming to a succinct conclusion I think many of us have come to: Hillary was never going to be able to save us. Only we can save us. I’ve got a few ideas for ways to resist. I’ll keep you updated with them as they become more solidified. Rinse your rice. (This is one of those tasks that as a beginner cook I skipped but that I never ignore now, as I know it leads to better, clearer-textured rice.) Put the rice in a bowl and cover with cold water. Swish it around a bit and then, using your fingers as a dam, pour out just the water and repeat two more times. If you have a rice-cooker, cook your rice in that. If you don’t, follow the package directions. Try to time this so that when the rice is done cooking, you are ready to assemble the onigiri. You want your rice to be hot. While the rice is cooking, mix the can of tuna with the mayonnaise. Taste it. If it needs salt, add salt. 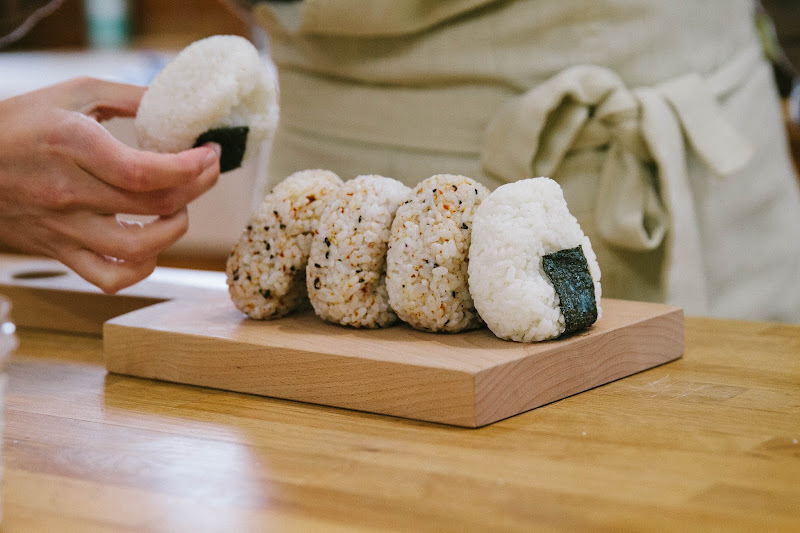 To assemble the onigiri: Arrange the pot of cooked rice next to a bowl with salt, the bowl with the tuna filling, and a bowl with a bit of water. Grab a ramekin or teacup and plastic wrap. Line the ramekin or teacup with a sheet of saran wrap. Sprinkle in a bit of water and then dump out any excess. Next sprinkle in a few pinches of salt. Fluff the rice with a fork. If you want to season the rice with furikake or some sesame seeds, go ahead and add a few tablespoons now. If you are moving forward with plain rice, just be sure to season it at the end or right before eating it. Scoop a large spoonful of the hot rice into the plastic-lined ramekin. Press it into the mold and then make a little well for the filling. P.S. I feel like I might be less scared to try making onigiri now! @Sara my heart is broken. masterful chefs, always the right balance of humor, humanity, information and fine editing. perfect ingredients for compelling video. The photo of Teddy next to the sign is killing me. His innocence, the quote, the cuteness of eating a snack. Lump in my throat! I continue to be impressed that Teddy eats such diverse foods! Nori and tuna.. whoa. Re politics in this depressing era, I am so grateful have experienced the Women's March in DC with savvy, like-minded, motivated, and funny (so many hilarious signs!)people. The march and the fact that I see very strong, well organized resistance to hate and bad policies lifts me up. Loved EVERY SINGLE THING about this video. The last sentence about saving ourselves rings true. I keep thinking HOW DID IT COME TO THIS and we are only finishing week 3. What is in the furikake? @Astrid there are lots of different kinds. This one has some dried seaweed, sesame seeds, red chili flakes, and sea salt. @David hi!! so so nice to see your name here!! Hope you and Adrienne and the boys are well!